Econsultancy’s David Moth takes on the User Experience Report 2013. 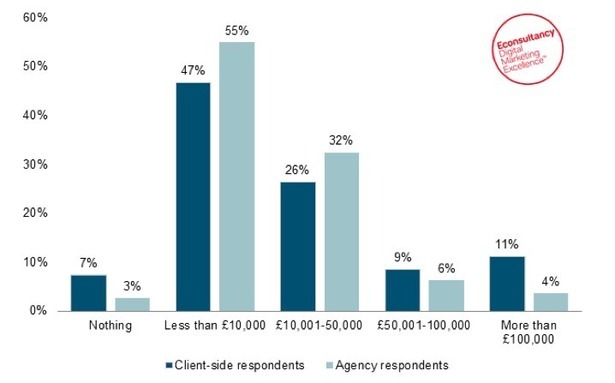 Almost half of businesses (47%) that carry out user experience testing spend less than £10,000 per year on such initiatives, while 7% don’t actually spend anything at all. In contrast, 11% of businesses spend more than £100,000 each year on UX testing. The findings come from the Econsultancy and WhatUsersDo User Experience Survey Report, which is based on a survey of more than 1,400 professionals working for brands, agencies and specialist user experience firms. The report shows that almost half of companies (49%) that run UX testing are planning to increase their budget in the next 12 months, with just 8% planning to spend less on UX testing over the next year. On average, how much do you or your clients spend on user experience testing each year? This suggests that businesses that are currently carrying out UX testing are experiencing some benefit from it and are willing to continue allocating budget, however a large proportion of companies still don’t do any UX testing on their products. Data included in the report shows that 12% of businesses do not carry out user testing and have no plans to do so, while a further 33% currently don’t but plan to begin testing in the next 12 months. Agencies were asked to state what the most common objection they received was when it came to UX testing. 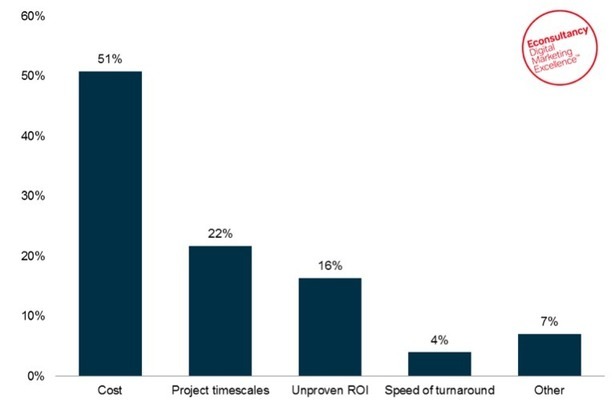 The majority (51%) stated that cost was the most common objection, followed by project timescales (22%) and unproven ROI (16%). What is the most common objection given by clients to user experience testing? 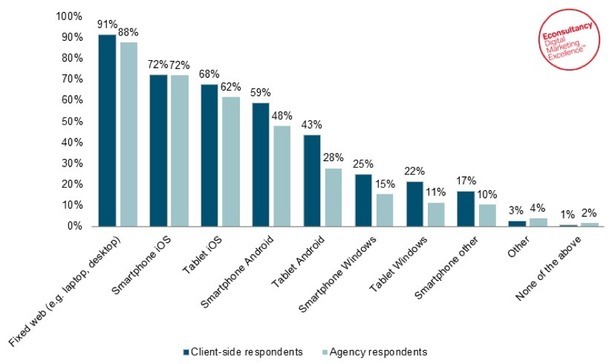 The final section of the report looks at UX testing on mobile and asks which devices take priority. The results show that desktop computers are still considered the most important device by some distance, as 91% of businesses stated that ‘fixed web’ devices (e.g. laptop, desktop) are regarded as a high priority when optimising the user experience. This was followed by iPhone (72%), iPad (68%) and Android smartphones (59%), while just 25% rated Windows smartphones as a high priority. Which of these devices do you or your clients regard as a high priority when optimising the user experience? David Moth is a Senior Reporter at Econsultancy. You can follow him on Twitter orGoogle+. The User Experience Survey Report, conducted by Econsultancy in association with WhatUsersDo, is based on a survey of more than 1,400 professionals working for brands, agencies and specialist user experience firms. The research looks at the approaches taken by companies and agencies, and the challenges and barriers they face. The report also covers the extent, aspects and methods of user experience testing currently being carried out.